Features are undoubtedly this laptop's strongest feature. For instance, the 13.3-inch screen is touch-sensitive, so you can prod the display to select options, drag your fingers up and down to scroll through documents or web pages, or even pinch them together to zoom in. Touch control is responsive and great for simply viewing documents or playing basic games. A standard (but small) touchpad is also available for more traditional control, although this can be turned off via a small button just above it. An LED strip at the top of the pad lights up to show it is active. There's also a touch-sensitive multimedia panel above the keyboard for pausing and skipping through songs and videos, and for activating the laptop's 'Eco mode' which immediately reduces power consumption by configuring system power settings. Usability is generally strong, but the low-quality keyboard lets it down. There's a considerable amount of flex in the centre and not enough travel, which leaves you hitting the keys hard to overcompensate. Despite the poor keyboard, build quality is decent, with an attractive, textured finish that prevents fingerprints and scuff marks. The chassis itself is tough, but also just about compact and light enough to carry around. Unfortunately, you'll also have to carry the charger, as the battery life of just 165 minutes is below par. 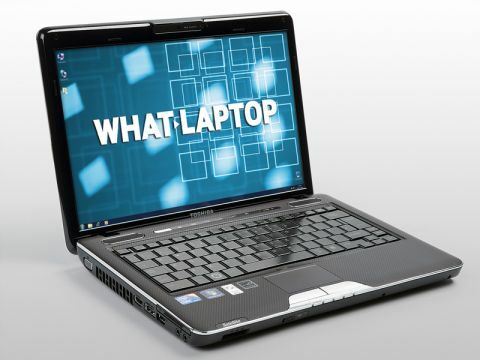 An Intel Core i3 processor runs the show and provides strong performance. Multitasking is not a problem and the 4096MB of high-speed DDR3 memory allows resource-intensive applications to easily be ran simultaneously. However, only basic gaming will be possible due to the use of an integrated Intel graphics card. Ports are comprehensive, with an ExpressCard slot for attaching peripherals and VGA and HDMI outputs for connecting an external display. An eSATA port doubles as a Sleep and Charge USB port, with two standard USB ports also included. Gigabit Ethernet and 802.11n Wi-Fi allow both wired and wireless network connections at the fastest speeds possible, and Bluetooth support is also included as standard. The Toshiba Satellite U500-1EX's impressive touchscreen usability and strong range of features lifts it above other laptops of a similar calibre, with the touch-sensitive screen and media bar offering a great means of control. Only the low-quality keyboard and poor battery life let the side down slightly.